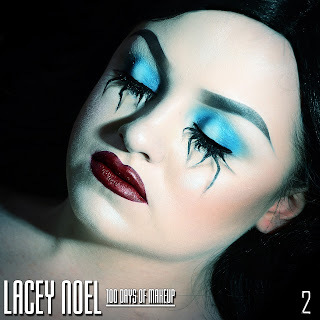 The Life and Times of Lacey Noel: Lacey Noel 100 Days of Makeup American Horror Story Inspired! Lacey Noel 100 Days of Makeup American Horror Story Inspired! DAY 2 of my 100 days of makeupchallenge! Since American Horror Story just released the new title of their 7th season, American Horror Story Cult, I thought I'd do the makeup from one of their Roanoke promos. EVERYTHING I used is from @katvondbeauty. The brows are: Latimus, Saleos, & Shax from the Shade + Light Eye Palette. Eyes: Saleos from the same palette on the brow bone, Doom from Pastel Goth, Dark Wave from Mi Vida Loca, Nile from Serpentina, and I highlighted the middle of my lid and my face with Saphyre from the Alchemist palette. The spiders are created from the Tattoo Liner in Trooper, and shaded with Lazarus and Saleos (Shade + Light Eye). Contour: Subconscious from Shade + Light. And finally lips are Nahz Fur Atoo Everlasting Liquid Lipstick! I've been meaning to do this one for a while, and I'm so glad to make it a part of my 100 days! 🕷🕷🕷🕷🕷🕷🕷🕷 photo by @missmissyphoto!